"Who's Afraid of Virginia Woolf?" 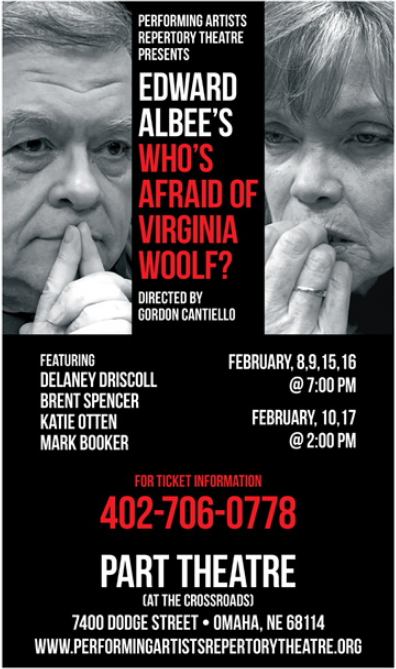 Actor Discusses Dream Role in Classic American Play "Live & Local"
Performing Artists Repertory Theatre, 7400 Dodge Street, Omaha, Nebraska, 68114, is happy to announce their upcoming production, "Who's Afraid of Virginia Woolf?" a masterpiece by the esteemed playwright, Edward Albee. The play examines the complexities of the marriage of a middle-aged couple, George and Martha. Late one evening after a university faculty party they receive an unwitting younger couple, Nick and Honey, as guests, and draw them into their bitter and frustrated relationship. Brent Spencer, who plays George, stops by to chat with Mike Hogan "Live & Local" on KIOS-FM. The play runs February 8th through the 17th. More information can be found at www.performingartistsrepertorytheatre.org.